So I can get this stuff off my desk. I am shamelessly begging. And I need to give it away to prevent myself from swapping it away. Think of the polishes I could get with Project Runway. I might actually be able to get La Boheme. *Dreamy eyes* And look at that lonely little Zoya in the background. It needs to go to a good home. Does this make you want to follow me more? Please? Pretty please? what are the ones in the middle? If I didn't follow you already I definitely would for a chance to wing those SH salon! Sarah: This sure is! I'm excited about getting them shipped off. Claudia: Those little guys are GOSH polishes. I figured I'd just grab every one I saw as it's hard for you guys down south to get them. 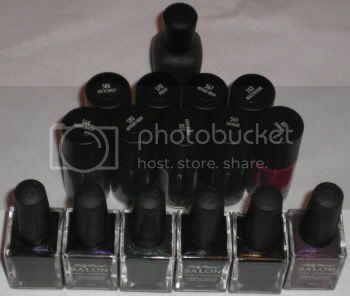 It's funny, this giveaway started with only a couple Runway polishes. I sorta want them gone YESTERDAY, though. They sit in this bag on my desk and are freaking heavy and they just get in my way, ya know? You're so funny. :D I am one of the 15 first persons who followed your blog. I can't subscribe twice, my dear. Though, I can read future. Yes, I can. I have a crystal ball, mysterious manners and all. And I tell you that you'll get your 100 followers before you even realize. Jellynat: If I had a crystal ball, it would definitely be telling me that you'll reach 100 followers and beyond. Your blog is awesome. I honestly look at your blog and think, man, if only I could get pics like hers. Good Luck! I'm rootin' for yah! You will get 100, I'm sure of it. Have fun and can't wait for the giveaway. I hope you get your followers! I have spread the word to friends. Get Nailed: They are indeed. 3 from the Project Runway collection and 3 from Passport to Milan. KML: Thank you, my dear. Evil Angel: Public begging will get you very very far. Lol. Halifax: I actually have multiples. So I'm just giving away extras. And I ended up buying some I didn't really like. So I'm giving some of those away too. I really should get on twitter, shouldn't I? I don't even have an account. I'll definitely consider it. Thanks mah dear. I'm totally followin' just for your pictures. Since I can't read a single word. Well, no, I can read one or two words, but that's about it. Lol. You're at 99! If you're not up to 100 by the time I post I'll put a shout-out on my blog. Almost there! Stephanie: Thanks so much. I am soooo close. Okay, I just edited my post with a link to your blog. I totally forgot the first time I published! Also...perhaps we could strike a deal for some $OPI polishes if you want. That's kind of ridiculous that they're so expensive up there. What kinda deal? And thankya very much. I just need one more and the giveaway goes up. Whee! Hehe...I wouldn't ask for your first born or anything so don't worry. What types of things can you get in the great white north that I can't get here in...the great white south? Got any extra SH Canadian exclusives lying around? You can e-mail me. I'm sodejablue@gmail.com. you made it! to 102 even. congrats!